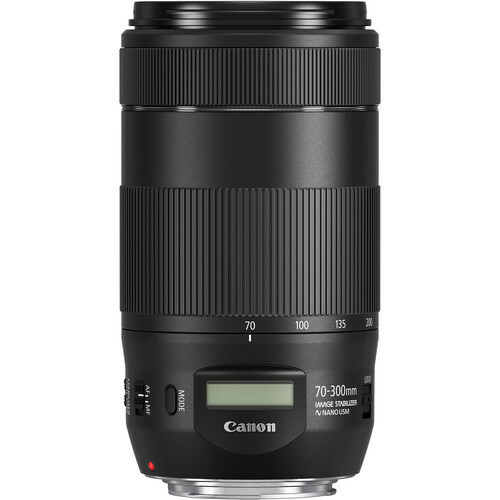 The EF 70–300mm f/4–5.6 IS II USM's NANO USM technology delivers quick, near-silent autofocus whether you're capturing an athlete jumping for a ball or recording wildlife in their natural habitat. For still images, it provides high-speed autofocus to help ensure you get the shot you want. When recording videos, the near-silent operation keeps unwanted noiseNOISEThe appearance of random pixels scattered over a photo, similar to the grain effect seen in film photography, which degrades photo quality almost as if it is stained. It occurs when taking photos in low-light conditions, with very slow shutter speeds on high sensitivity (ISO) settings. It is caused by amplification done by the sensor when high ISO settings are used. You can counteract digital noise by lowering the sensitivity (ISO) setting of your camera - the lower the ISO setting, the lower the noise in the image. Typically cameras with larger sensors (like full-frame cameras) will inherently produce less noise due to larger pixels on the sensor. out of your videos. For additional artistic control, manual focus is also possible even when the lens is set for autofocus. This means that when recording a video, for example, you can slowly pull in or out of focus for a dramatic effect. 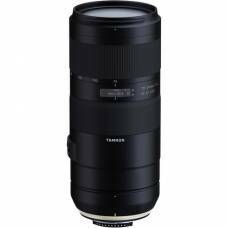 The EF 70–300mm f/4–5.6 IS II USM features a new integral Lens Information Display for fast access to a wide variety of lens information. This lets you see the information you need at a glance, and then get right back to taking photos. The focusing distance display mode provides the distance the lens is focusing and an estimate of the depth-of-field, while the focal length display mode shows the 35mm-equivalent focal length. In shake amount display mode, the Lens Information Display gives an estimate of how much the lens and the camera are moving. To aid viewing in different lighting conditions, both black text on a light background or light text on a black background are selectable. 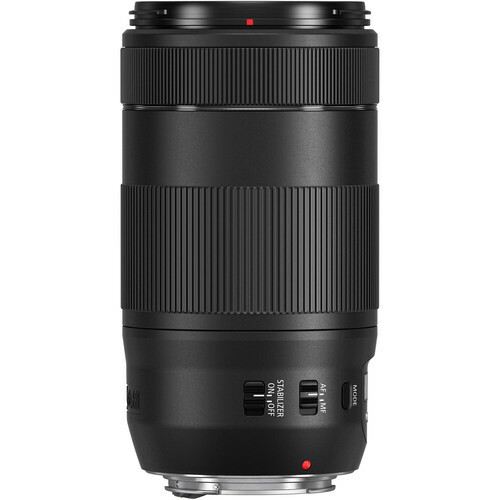 With an all-new design, the EF 70–300mm f/4–5.6 IS II USM features 12 groups with 17 total elements, including an optimally positioned UD lens. UD, or Ultra Low Dispersion, helps correct chromatic aberrations (colored halos around objects) while reducing color blurring and keeping overall detail high. This helps the EF 70–300mm f/4–5.6 IS II USM produce sharp, high-contrastCONTRASTThe difference between areas of different brightness levels in a photograph: A high-contrast image has a greater difference between light and dark areas, whereas a low-contrast image has a narrow range of tones. Contrast is used to direct a viewer’s attention to a photographer’s subject either with colour contrast (bold versus duller colours) or tonal contrast (bright versus darker tones). , richly colorful images throughout its zoom range. 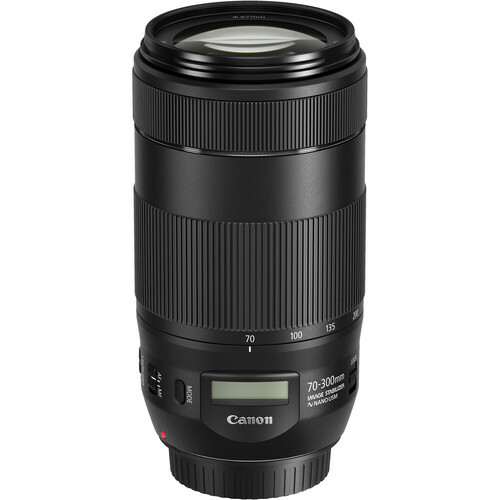 For consistently sharp results, the EF 70–300mm f/4–5.6 IS II USM features an improved Image Stabilizer system that provides significantly enhanced shake reduction for up to 4 stops of shutter speedSHUTTER SPEEDAperture, shutter speed and ISO form what is known as the exposure triangle in photography. Shutter speed is the length of time that a single frame is exposed for, more specifically how fast the shutter opens and closes to permit light entering the lens, to reach the sensor. A slow shutter speed means a longer exposure time useful for motion blur like the silky look of flowing water, whereas a fast shutter speed means a shorter exposure time useful for freezing the appearance of motion in images like a hummingbird in flight. It is measured in seconds starting at 1 second and halving our doubling in time. For example: 1/2s, 1/4s and 1/8s are all fractions of a second with 1/2s being the longest exposure time, 1/4s half of that and 1/8s another half etc.s. This means more reliable handheld performance and clearer detail in low-light situations or at lower ISOs. 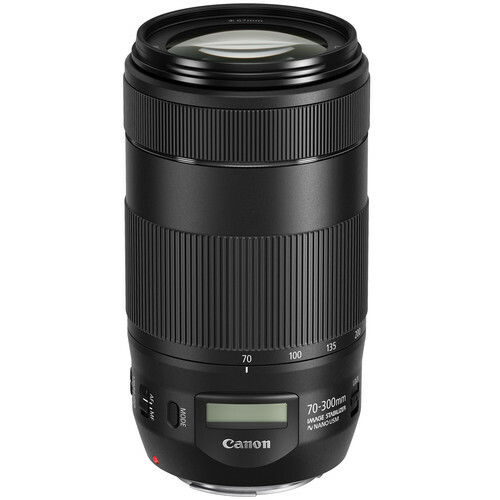 Because of its enhanced stabilization, the EF 70–300mm f/4–5.6 IS II USM can also help minimize the need for a tripod. The EF 70–300mm f/4–5.6 IS II USM offers complete manual control, even when AF is engaged, with a simple twist of the lens's focus ring. Additionally, full-time manual focus means it's easy to achieve and maintain focus manually, which can be especially handy when shooting video or composing still images on a DSLR's screen.